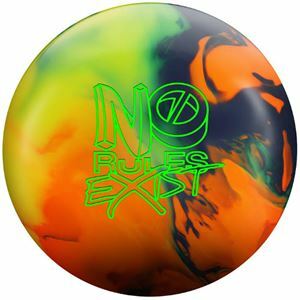 Featuring the new Reckless Solid Reactive coverstock (also featured on the Dare Devil Trick), the No Rules Exist delivers more length and change of direction than the No Rules, bringing a devastating new motion to the lanes. Combined with the Chaotic Asymmetric Core, this ball is strong throughout the entire lane and brings exceptional action where it counts - the pin deck! This ball comes out of the box at 2000-grit pad finish and because it is a natural solid reactive shell, it can easily be sanded to take on more oil. Or it can be shined to battle less oil. This cover/core combo presents yet another versatile piece that some will tend to use as a benchmark ball.